The June issue of CQ is our fourth annual Take it to the Field Special, packed full of articles and columns on operating away from your home station, both in our print edition and in the expanded CQ Plus portion of our digital edition. Our front cover offers a montage of several different "to the field" activities highlighted by this month's authors. We start out with a report by International Editor Tom Smerk, AA6TS, on the growing interest in ham radio among 4-wheelers, who appreciate its value when off-roading beyond the range of cell-phone towers. Next, Charlotte Austin, AF7DY, takes us kayaking in Puget Sound and explains how keeping in contact with her dad on her HT made the trip extra special. Cody Codianni, KC2LSD, goes to the water's edge with his article on operating EME (Earth-Moon-Earth) with low power and a single Yagi … from the beach! And Gary Liljegren, W4GAL, also hits the beach with his low-powered JT9 digital HF station. Ed Cobb, K4YFR, takes us on a more traditional portable operation, using his RockMite on a camping trip to Portsmouth Island, North Carolina. A small CW rig can benefit from an equally small paddle, and George Averill, K4EOR, shows us how to build one from a couple of paper clips! And speaking of CW in the field, Cory Sickles, WA3UVV, describes his portable "Tapper-Walkie" setup. We've got three pieces on portable antennas - Richard Pav, K2RFP, shows us how to build a portable 20-meter ground plane and spooler; Gary "Joe" Mayfield, KK0SD, describes the antenna stand he built for field operating, and Stanley Chassagne, KJ6TJY, puts a tape-measure into service as an antenna for "foxhunting" or radio direction finding. Finally, John Nistico, NY6DX, who maintains the field lighting for a minor league baseball team, explains how he was able to use the ballpark during the off-season for some major league contesting! 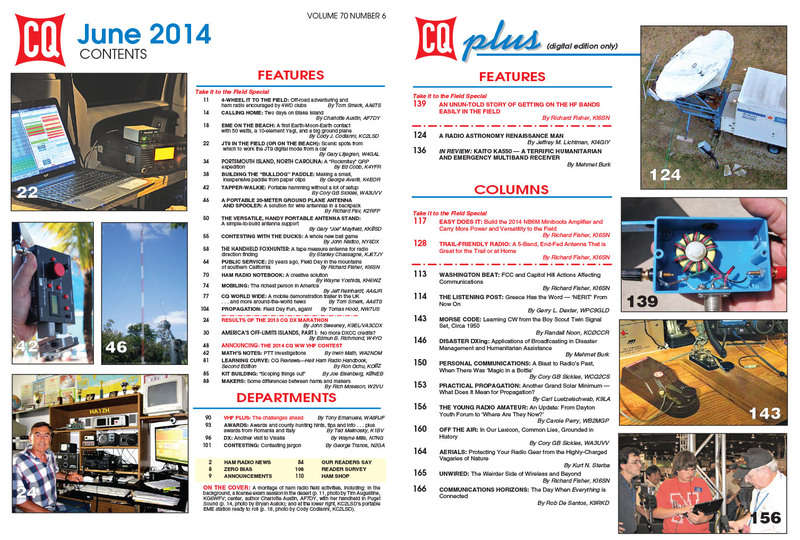 If portable operating isn't your cup of ham radio "tea," we've also got the results of the 2013 CQ DX Marathon (OM3EY and HA1ZH were this year's big winners), rules for the 2014 CQ World Wide VHF Contest (July 19-20), and a report by Ed Richmond, W4YO, on (lack of) operating possibilities from "America's Off-Limits Islands." Among our columns, "Math's Notes" looks into different configurations for push-to-talk (PTT) switches on microphones; Public Service Editor Richard Fisher, KI6SN, takes us back to the field and back in time to Field Day 1994, when a wildfire turned a Field Day operation into a for-real emergency communications activity; and in "Ham Notebook," KH6WZ shares a "creative solutions from an unusual inspiration." Mobiling Editor Jeff Reinhardt, AA6JR, takes a tongue-in-cheek look at "the richest person in America" and highlights a couple of first-class mobile installations. International Editor AA6TS shows us a mobile demonstration trailer from the United Kingdom, "Learning Curve" editor Ron Ochu, KO0Z, reviews the second edition of the Heil Ham Radio Handbook, by Bob Heil, K9EID, and Kit-Building Editor Joe Eisenberg, K0NEB, looks at oscilloscopes and a couple of interesting kits. This month's "Makers" column highlights some of the differences (as well as similarities) between hams and makers; Tony Emanuele, WA8RJF, joins us as our new "VHF-Plus" editor and looks at "the challenges ahead" for VHFers; and Awards Editor Ted Melinosky, K1BV, offers county-hunting tips and info on awards from Romania and Italy. DX Editor Wayne Mills, N7NG, recounts his most recent trip to the International DX Convention in Visalia, California; Contesting Editor George Tranos, N2GA, helps new contesters decipher some contesting jargon, and Propagation Editor Tomas Hood, NW7US, offers predictions for Field Day and the rest of June. A five-band end-fed antenna with innovative counterpoise system that can make your trail-friendly adventures even more exciting. It is the antenna designed to accompany the 17-40 meter antenna coupler featured in February’s QRP Special. A 9:1 unun impedance transformer for putting your shortened end-fed wire on 75 and 80 meters. A 10+ watt solid state amplifier to give your QRP rig additional power when you’re on the trail. Also, meet Robert Stephens, a deep-space pioneer who developed a plan to establish a professional caliber astronomical radio observatory to conduct Canada’s first full-time SETI (Search for Extraterrestrial Intelligence) microwave space exploration program. 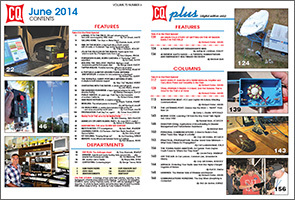 Also in June’s CQ Plus, Disaster DXing’s Mehmet Burk reviews the Kaito 550, “a terrific humanitarian and emergency multi-band receiver.” Morse Code’s Randall Noon, KCØCCR, goes down Memory Lane with the Official Boy Scout Twin Signal Set – many a young boy’s and girl’s introduction to “digital communications” dating to the 1950s. And do you remember when Citizens Band radios glowed in the dark? Personal Communications’ Cory GB Sickles, WA3UVV, sure does. Tube-based CB radios can found at coffee breaks and hamfests even today! Propagation expert Carl Luetzelschwab, K9LA, tries to get to the bottom of yet another perplexing question: Just what does another grand solar minimum mean for conditions on the radio amateur and shortwave listening bands? Carole Perry, WB2MGP, does a “Where Are They Now?” update on some of the amazing speakers from past Dayton Hamvention® Youth Forums. Don’t miss her column in June’s CQ Plus – The Young Radio Amateur. Rob de Santos, K8RKD, gives a glimpse of a world where technologically, “everything is connected” – a fascinating look to the not-too-distant future. That's a brief look at what's coming up in the June issue of CQ magazine -- in print and online, as well as the digital-only CQ Plus supplement. For information on becoming a CQ subscriber - to either our print or digital edition - click here! Zero Bias - "New and Different (Or Not . 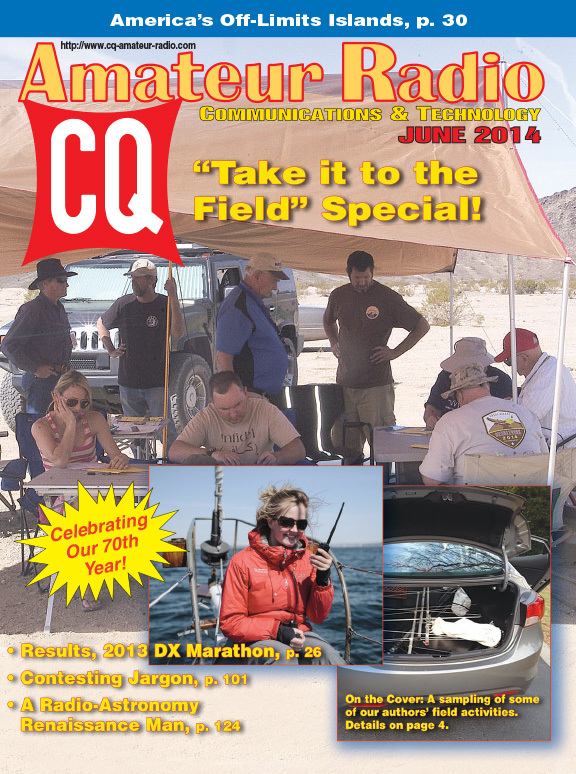 . .)"
On the Cover: A montage of ham radio field activities, including: In the background, a license exam session in the desert (p. 11 / photo by Tim Augustine, KG6WFV); center, author Charlotte Austin, AF7DY, with her handheld in Puget Sound (p. 14 / photo by Bryan Aulick); and at the lower right, KC2LSD's portable EME station, ready to roll (p. 18 / photo by Cody Codianni, KC2LSD).